We continuously develop our GeoStore in order to offer you the best possible online experience. Stay up to date on the latest improvements in GeoStore. The Basemap provides you with the context needed to prepare and perform your missions or to create precise maps, anywhere on the globe. This worldwide layer is made from our highest-grade, curated, satellite imagery and is constantly refreshed. Contact us to access our service at full resolution. Discover the basemap layer with limited zoom (10m resolution) and accessible directly in the GeoStore layer! Discover our Basemap on GeoStore! In one click, you can now see the available product layers covering your AOI. To do this, select your product (Spot, Pleiades, WorldDEM…) which will be highlighted in yellow and the coverage layer will also appear highlighted in yellow on the map. You can also display the global coverage of the products by clicking the button, it will appear in white (see example below). You can now add credential layers to your choice in GeoStore. First of all, click on the “Add layer” button. Then choose the type of layer and copy the URL of the layer into the Reference part. Finally, you need simply give a name to your new Layer. If this requires a login/password you can enter them by activating the “Access code” part and inserting your login and password. 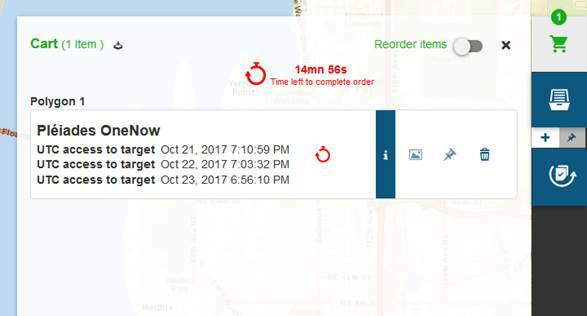 In GeoStore, you can now see the time left before your One Tasking order expires. This will enable you to make sure that you complete your One Tasking order on time. Once this time has expired, your order will be cancelled and you will have to repeat your request with new programming times. The countdown will be automatically activated in your cart 15 minutes before your order expires. 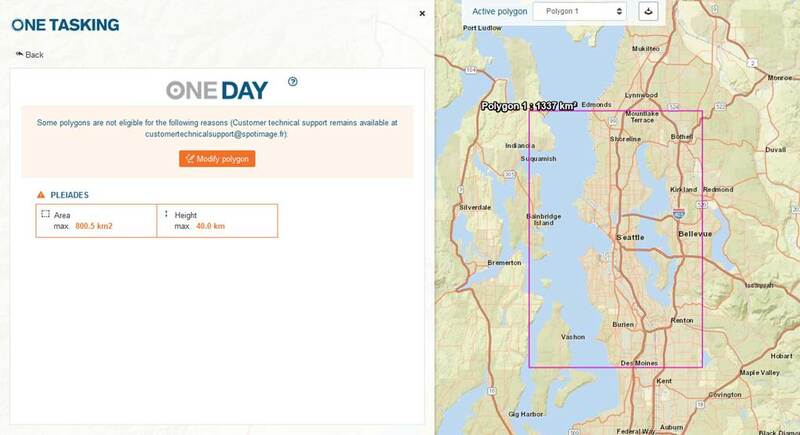 New: GeoStore helps you modify your polygon to make it eligible! You can now directly see why your polygon is not eligible for the One Tasking offer. You can immediately access the applicable min. or max. limits. You can thus modify your polygon in order to comply with the One Tasking specifications.